Ada egg hunting, a photo by Southworth Sailor on Flickr. Saturday's sunshine greeted the birthday celebrations of mom and Ada. Combined, their ages are 90, Ada 2 and mom 88. We celebrated with Mom at the Courtyard. Balloons were definitely a hit with the young and old alike. Mom really enjoyed batting the balloon back and forth. My sister Ellen was up for spring break so all of Mom's children were there as well as several grandchildren and great grandchildren. Ada's party was later in the afternoon and featured the color blue and pizza. Both sets of grandparents and various friends joined the Greenwood Gang to help celebrate. 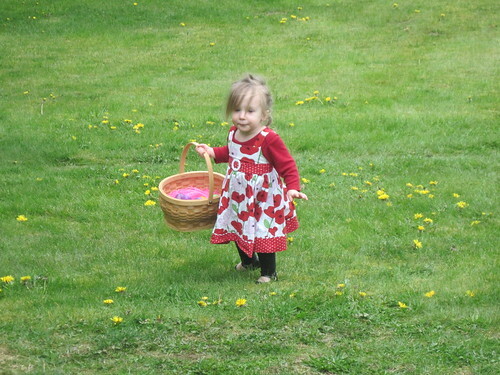 The next day was Easter and after a worship service at Oikos and a big dinner, Ada enjoyed her first egg hunt. She had a lot of help both finding the eggs and eating the treats.